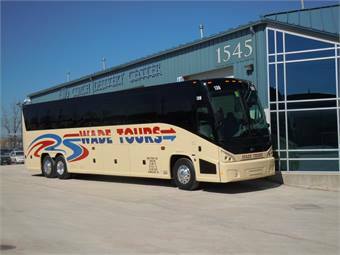 This July, the 87-year-old Wade Tours, based in Schenectady, N.Y., will take to the road with a Motor Coach Industries 2013 J4500. The newest J4500 joins a modern 29-coach, all-MCI fleet. It is enabling drivers to register close to 10 mpg, featuring a clean-diesel Detroit Diesel/Allison powertrain. The coach also features options such as 110-volt outlets, and Wi-Fi. Wade Tours has been helping passengers see the country since 1926, when Edwin Wade started the company with single 1926 Studebaker. The company prospered, providing transportation to historic events including the World’s Fair in New York City and the Winter Olympics in Lake Placid. Today, Wade Tours serves a wide variety of tour and charter customers, also running a full-service travel agency for trips all around the world. 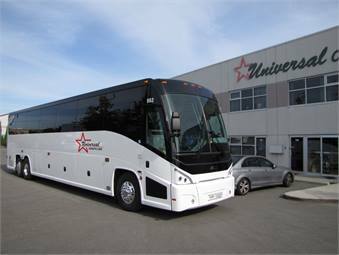 Meanwhile, Vancouver, B.C.-based Universal Coach Lines has taken delivery of three 2013 MCI J4500s to accommodate a 200% increase in business from China. The new MCI J4500s feature many model-year improvements, including dramatic new LED headlights, a taller appearance and a host of performance updates, including a more fuel efficient, clean-diesel powertrain. Universal Coach Lines additionally opted for a Wi-Fi hub and 110-volt outlets to meet market expectations. The new MCI J4500s fit in well with the rest of the company’s nearly 100 coaches — many of which are earlier-model J4500s. Universal Coach Lines is the third-largest privately owned coach operator in Canada, according to the carrier.